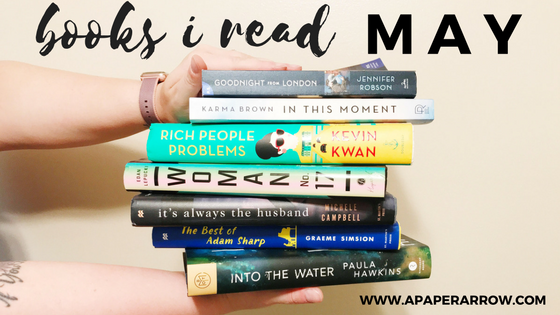 I'm giving away two ARCs - one of Paula Hawkins' Into the Water and one of Michele Campbell's It's Always the Husband. To be clear, I did not purchase these novels, however, I received multiple copies of both books and would love to share them with one lucky reader. Enter the Rafflecopter below to enter. Please note that winners will be verified. * denotes that the book was received free in exchange for a review. All review, as always, are 100% my own. Wow, you killed it this month! So many interesting looking reads! I hope you find some new favorites! I'm dying to read Into the Water. I'm in line for it through my library e-book system and I'm getting really impatient. I'm going to add It's Always the husband to my list too. Thanks for the recommendation! Hopefully you'll get ahold of it soon. It's so interesting! And yes- It's Always the Husband was definitely a great one too. Definitely adding some of those to my list! I also enjoy Karin Slaughter novels when I'm in the mood for a thriller. Good stuff! I've only read Pretty Girls, but my mom basically has every Karin Slaughter ever - and I hope to read more of them in the future!